If you’re participating in our Tea Leaves or Tiramisu knitalongs, we’ve updated plans for the finale party. The new date is Sunday, May 4, at 4 p.m. Bring your finished (or partly finished) projects and show them off. You’ll be entered to win one of our prizes, and get to share a look at how everyone else’s projects came out. 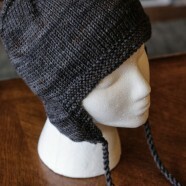 The Twig Earflap Hat pattern is available on Ravelry, and was knit with Madeline Tosh Vintage in the Twig colorway.